In the kernel build post, we build pcDuino kernel on a X86 PC with cross-compilation. In this post, we are going to show something interesting by building kernel on pcDuino itself. Besides the time it takes to build, another issue is the storage space on pcDuino. There are two ways to get around: one is to use a large SD card, and the other one is to use NFS to make an external storage area to pcDuino. Note: If we build the kernel in this way, it will take a long time. We just show that this is possible, but it is not recommended. We recommend to build kernel on x86-64. For your convenience, we hosted the kernel source files for pcDuino also at amazon cloud. We are going to work at at directory “ /lib/modules/3.4.29+”. sun4i_defconfig’ to the directory ‘build’, and rename as ‘.config’. 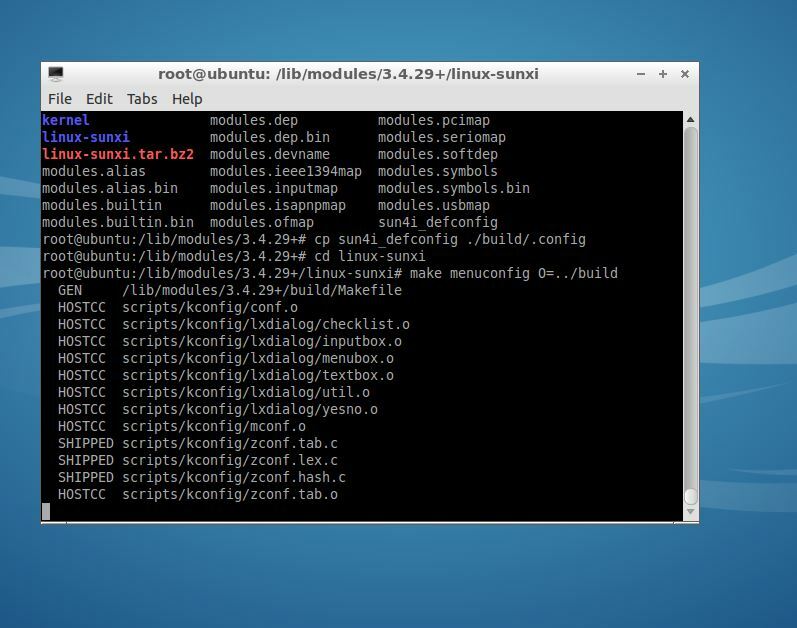 We select “Load an Alternative Configuration file” to load “/lib/modules/3.4.29+/build/.config”. As shown on the above figure, we locate the line “Initial RAM filesystem and RAM disk (initramfas/initrd) support, and press ‘ENTER’ to remove the asterisk ‘*’. The above process will take about 4 hours. Please wait patiently.